Some of the best lake fishing for trout can occur right after ice-out. But you need the right tackle and techniques to be successful. 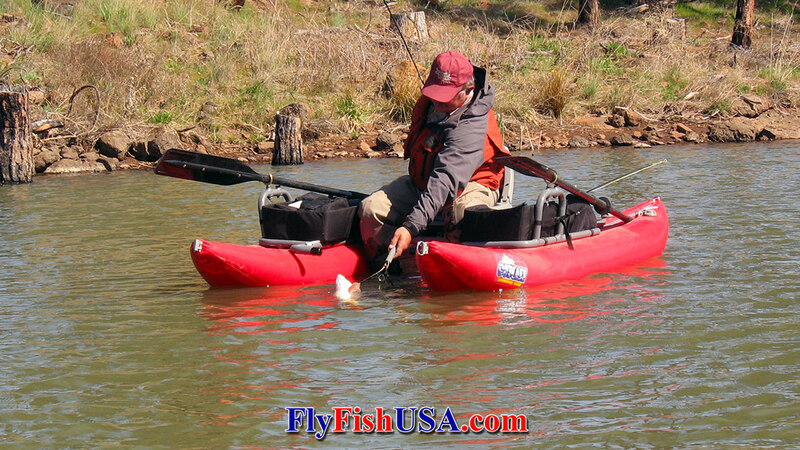 Having the right flies and the right fly lines to fish them properly is essential. When the water is near freezing, trout and everything they feed on moves in slow-motion. Most feeding occurs within inches of the lake bottom. Keeping your fly in the strike zone and moving at the right speed are the ingredients for success. In this game, using a fly line with exactly the right sink rate can make all the difference in how many fish you will land. Since most lakes can vary drastically in depth from one area to another, having a battery of lines with different sink rates will allow you to cover all the water. My own lake set-up incorporates floating, intermediate and sinking lines, as well as flies of different sizes and weights. This allows me to put my flies in the strike zone and keep them there while moving them very slowly. Check out these essential fly lines for early season lake fishing: Cortland Denny Rickard's Clear Tip, Cortland Classic Intermediate, RIO Aqualux Midge Tip, RIO InTouch CamoLux, RIO InTouch Deep 3 Full Sinking. These lines offer a wide variety in sink rates, and in some cases a range of prices. Of course you will also want to bring your favorite weight forward floating line for times when trout are taking dry flies and surface emergers. Being able to change the depth of your presentation quickly with the depth of the water and changing weather conditions is paramount to success on lakes any time of year. Therefore, having two rods rigged with different lines is easier than stopping to change reels or reel spools. You will need a rod holder for your second rod on your float tube or pontoon boat. If it is within your budget, assemble your lake fishing system from rods of the same line-weight and two identical reels, so that all the spare spools interchange. In lake fishing, reels rarely get dunked and although having a waterproof drag system is always preferable, it is not mandatory for success. Trout that live in lakes are often larger than trout that live in streams. Five weight rods are usually adequate, but six weight rods will handle larger trout easier and throw big flies in the wind better. If budget is a factor, two TFO BVK Rods with two TFO Prism reels will get the job done for years. Add extra spools and lines as needed. If price is not a factor: Two Sage X rods with 6200 series reels is the core for a dream-time lake fishing system. Trout that have been living under ice for a couple of months have forgotten about humans and can be pretty naive. But, these trout can still be fairly selective in what they eat. During the earliest part of the year, only a few of the lakes' aquatic organisms are active. Midges, water boatmen, damsel nymphs and leeches are the first lake inhabitants to get moving. An assortment of flies that simulate these critters is necessary for success. Remember, everything is moving in slow motion and your sunk flies should move very slowly also. To accomplish this, your boat (pontoon boat, or float tube) must be stationary. This is easy to do on calm days. You simply sit in one place and retrieve your fly slowly. On windy days, your boat must be anchored or the wind will move it much too quickly and you won't be able to work your fly slowly enough. As stated above, a line with the right sink rate for the depth you are fishing is key to success. If the line doesn't sink fast enough, your fly will ride too far from the bottom for the trout to even notice it. If your line sinks too quickly, either you will have to retrieve your fly too fast to look natural, or you will be plowing your fly into the bottom and picking up debris on your hook. You rarely get a strike when your hook is fouled. A lake usually warms in the shallow water around the edges first. A very slow sinking line like a Cortland Classic Intermediate, or RIO InTouch CamoLux will fish your fly slowly if the water is from three to five feet deep. Sometimes trout move into water that is less than two feet deep. A floating line with a clear tip such as RIO Aqualux Midge Tip,,, or Cortland Denny Rickard's Clear Tip is excellent for shallow water. When water is less than eight feet deep a RIO InTouch Deep 3 Full Sinking is often the answer. Flies of various weights also help adjust the depth of your presentation. A fly box well stocked with different sizes and weights of midges is essential for fishing lakes nearly any time of year, but can be even more important early in the season. Midges seem to have a natural antifreeze and can be very active when the water is barely above freezing. Fish feed on these prolific insects at all depths. Midges can hatch nearly any time of year and often produce the first dry fly fishing available on most lakes. Trailing your midge pupa off a deep sunk slow moving leech pattern can pay big rewards. Strikes can be very light. Your line needs to be free of slack to maximize the "feel" of the bite. InTouch lines with non-stretch cores are great for detecting soft strikes. Leeches are often very active during dark cloudy spring days. Try the Bead Head Mini Leech series and Mohair Leech series. Both series com in three colors. Mohair leeches are light weight for fishing shallow water. For early season fishing, it's hard to beat Bachmann's Bead Head Leech as your basic deep-sunk searching fly. Many colors work, but if you aren't getting strikes change to a different color or a different size. A sleeper color for early in the year is olive green with a touch of orange such as the Denny Rickard's Stillwater Nymph is always a good bet. Speaking of green, Cal Coal, one of the more renowned lake fishers of recent history, said that the only fly you need for lakes any time of year is an "inch-long and green." No doubt this simplistic approach has merits, but we have seen times when 3/4" inch long and green worked even better. One of these periods is early in the year when trout are feeding heavily on immature damsel fly nymphs. The nymphs are normally very light-colored. We list them as Mark's Olive Damsel Nymph, or Mark's Golden Olive Damsel Nymph .